Erse Park was an almost inexcusable credit whore stop. Being present at opening meant that we'd each enjoyed our lap on the Butterfly (#1420) before any other guests turned up, avoiding a significant amount of potential embarrassment. A few moments later we'd also ticked off the Familienachterbahn (#1421). There were two other rides of interest in the park; the first was a highly themed rapids ride that was roped off; the second was the Bobkart. I managed five laps before it was time to move on. Rasti-Land has painted their Achterbahn (#1422) a rather hideous pink colour that can be seen through the trees as one drives into the car park. Enthusiasts should be aware that it takes a good ten minutes to walk from the car park to the entrance, and then the same time again back to the coaster; even hardened credit whores will need at least an hour to complete this park, and to race through it would miss out on two truly excellent rides. The first of these, located beside the coaster, is the single most impressive Bobkart I've encountered to date. 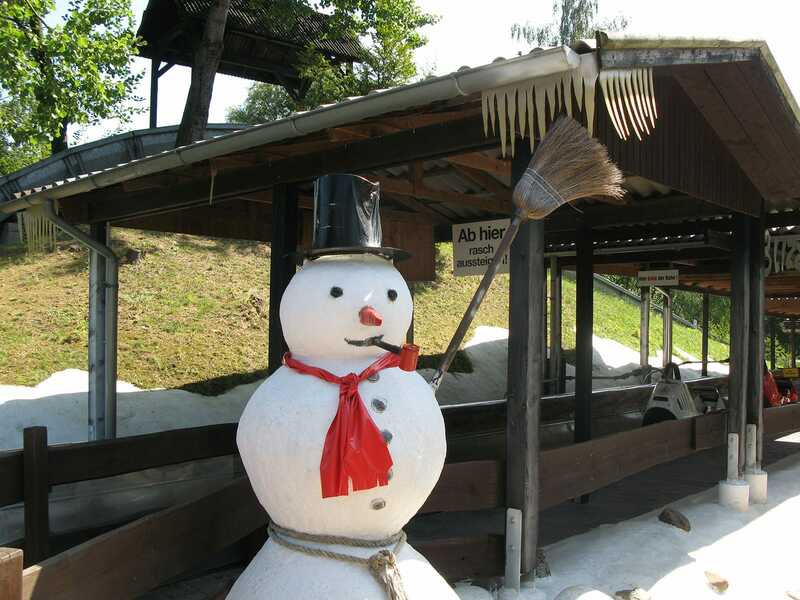 The station features some theming to make it look at least a little bit like a bobsled run, even down to a rather formal looking snowman pictured above. Once on board, riders enjoy a particularly long course which features a number of substantial changes in elevation that provide something that might even be called airtime. Rather intriguingly there are several points on the circuit where one is advised to use brakes, not something I've ever seen on one of these rides before (and not something I paid any attention to!). 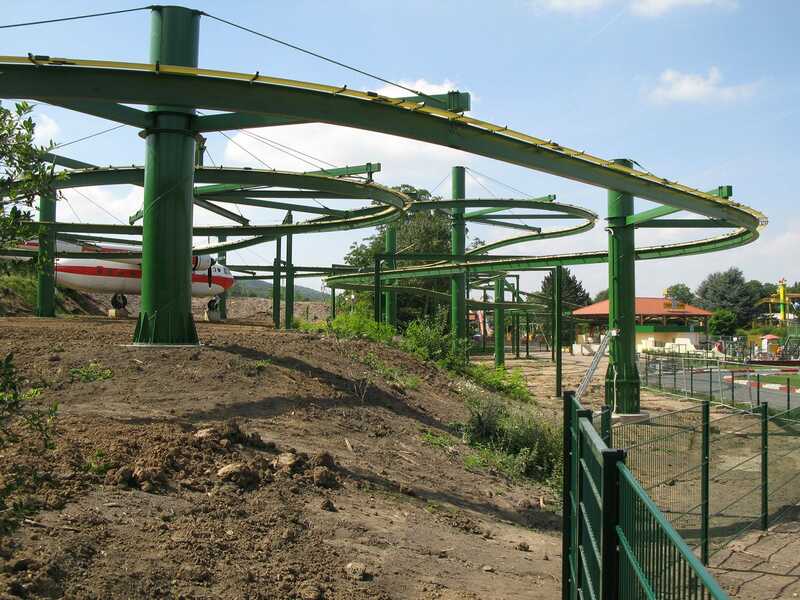 Though the park map refers to a Sommerrodelbahn all that can be seen in that area is a few sign frames, a traffic light, and a concrete foundation. In our search however we did run into a superb dark ride. The Piratenfahrt has a rather dated track system, but this was the only weak point of an attraction that would otherwise fit in well at Efteling or Europa Park. Of particular note were a number of animatronics which reacted as the cars passed by. It was clear even on approaching Potts Park that the new powered coaster, Turbo Drachen, had yet to open to the public. Signage within the park indicated a target of the second half of August, but judging by the state of the ride today there appeared to be a fair bit of work to complete still. We were left with the consolation prize of Potts Blitz (#1423), significant only for the spinning propellers located on both ends of the train. The last park of the day, pronounced stoo-ken-brok, is predominantly a safari park where the various amusement rides take back seat to the animals. It was no real surprise to see that both were named appropriately; the Marienkäferbahn (#1424) and the Flying Tiger (#1425). The latter looked stunning thanks to a shiny new coat of paint. It also proved remarkably smooth for a vintage Vekoma right up until the end of the second corkscrew, when an unexpected slam left me with a decent sized bruise on my shoulder.